What a winter we're having here in the Northeast! We've been dashing through the snow for almost two weeks now largely because the temperature hasn't risen above freezing to melt the white stuff. While I love snow, I have no tolerance for temps that dip below 20 F. My Uniqlo Ultra Light Down Vest (above) is one of the biggest reasons I'm still smiling. 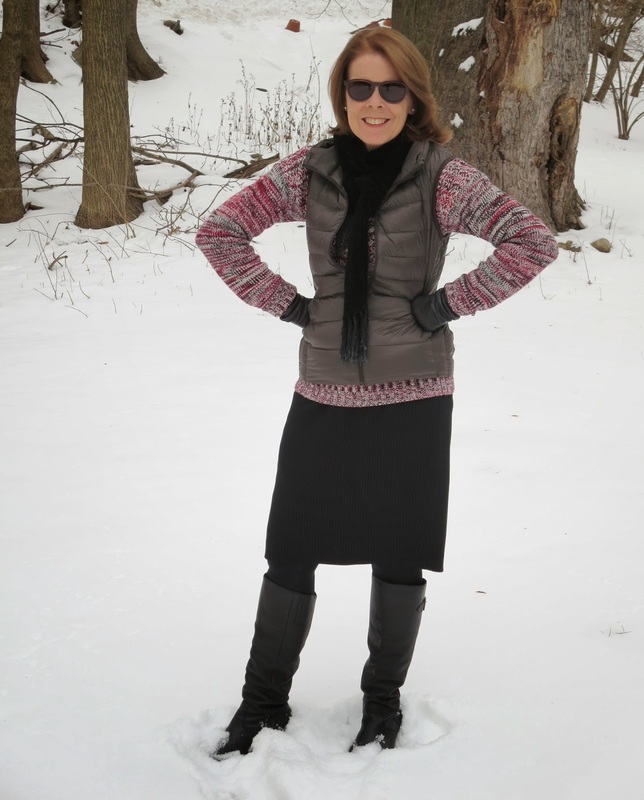 It's cozy warm without adding a lot of bulk--the perfect combination for this over 50 woman's winter look. My #1 defense against the cold: Layers. Unfortunately, layers often makes me feel like a fur trapper--not too feminine, that is. For years, I've worn fleece jackets under and over other layers. However, even my fitted fleece jackets look burly and drab. Earlier in the month, during an arctic blast (when it's 6 F, but feels like -11 F--yikes! ), I was in New York City and shivering. Desperate for another layer, I ran into Uniqlo's flagship store on Fifth Ave. I'd heard the brand's ultra light down coats and vests were, well, ultra light, yet very warm. I tried on a vest and loved the fun, fitted look. It's the perfect extra layer to wear under a parka in the coldest weather or over a heavy sweater on milder days. But what really sold me was the vest's nylon storage pouch. I can fold up the vest and tuck it into the separate pouch, which is not much bigger than a back pocket (below). That means I can carry it in my shoulder bag and use it as a back-up layer when needed. And, of course, it's great for traveling at this time of year. The vest, however, wasn't going to solve my icicle finger tips. My favorite leather gloves with a thin lining are no match for the frigid weather. So...I poked around Uniqlo and found a pair of thick Faux Fur Gloves (below). The gloves are fluffy on the knuckles side and smooth on the palm side. I was skeptical about their ability to keep my hands warm, but at $9 (originally $12.90, now $7.90) a pair, it was worth a try. (I don't have big hands, but I bought the M/L, which fit well.) The gloves are very warm. They've been a life-saver and make me laugh every time I wear them. Why? Because they remind me of the shaggy paws of White Fang on the Soupy Sales Show. Remember? By the by, I'm not being paid by Uniqlo to say any of this. I just think the brand is worth checking out. Yes, it's a very modestly-priced clothing line. And yes, I wouldn't recommend women over 50 wearing all its fashions or even most of its fashions. However, if you are prepared to pick and choose, I think you'll find some really fun stuff.